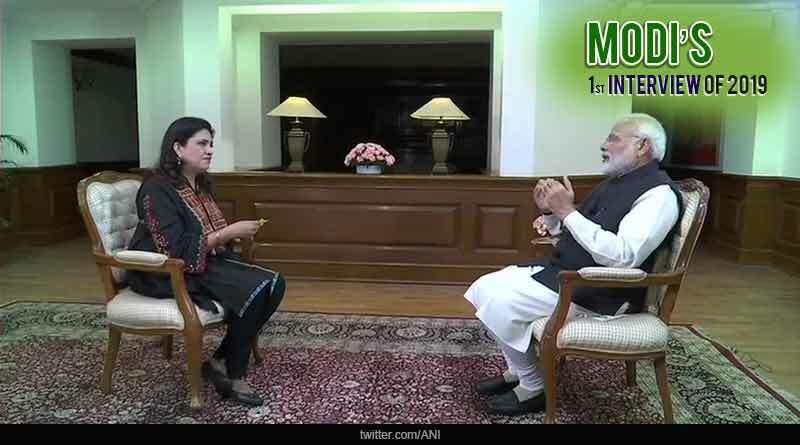 Modi’s first interview of 2019 – Giving his first interview of the new year, Prime Minister Narendra Modi sat down to speak at length on a variety of issues. In an interview lasting 95 minutes, the prime minister addressed topics like GST, general elections, surgical strikes and Ram Mandir, clarifying his and his party’s terms on the hot issues that have taken the country by a storm over the last year. He also used the interview as an opportunity to answer his detractors in the build up to the general elections of 2019, elaborating about the BJP’s ideas for the upcoming elections. On Opposition’s Mahagathbandhan: All who looted India are coming together. It is going to be ‘Janta’ versus ‘gathbandhan’ in 2019 elections. Modi is just a manifestation of public love and blessings. The people of India are seeing how leaders who want to loot are closing ranks and forming alliances. India’s prime minister also hit back at the Congress on their recent Rafale deal allegations against him and his government, saying they were all fabricated lies being spread by the Congress to defame him and the BJP ahead of the Lok Sabha elections. He also questioned the opposition’s claims of 100% farm loan waivers that had been announced in the three states that the party won in the recent assembly elections. In an uninhibited interview by Modi, he faced the questions posed at him unflinchingly, answering at great lengths. We take a look at the key areas addressed in Modi’s first interview of 2019. Modi said that the elections were going to be “janta” versus “gathbandhan” and affirmed that the BJP will spare no expenses in ensuring they comeback for a second time and ensure that people keep getting the benefits of high quality good decisions and a government that truly works for their benefits. Speaking on the success of the government’s revolutionary scheme to provide low cost and effective healthcare to citizens of the country, Modi said: In just 100 days, nearly 6 lakh people have been benefitted from the scheme. “All my foreign trips are at the minimum cost. I visit foreign nation in the interest of the nation. All PMs have had many foreign visits in the past.” He emphasised that meetings held abroad are of great consequence, with large deals at stake and these are not things that can be finalised on the phone. Reiterating about the Ram temple, that the party was committed to finding a solution to the issue within the framework of the Constitution, PM Modi said, that the government will take the course of action and implement what has been promised but only after the ordinance on the temple has been passed by the courts. “We have said in our BJP manifesto that a solution would be found to this issue under the ambit of the Constitution. Let the judicial process be over. After the judicial process is over, whatever will be our responsibility as the government, we are ready to make all efforts,” he added. “He himself requested (to resign) on personal reasons. I am revealing for the first time, he was telling me about it for past 6-7 months before his resignation. He gave it even in writing. No question of political pressure. He did a good job as RBI Governor,” Modi said. “Those who fled during this government, they will be brought back, today or tomorrow. Diplomatic channels, legal courses and seizure of properties being done. Those who have stolen India’s money, they will have to compensate for each and every penny,” he said. PM Modi’s first interview of 2019 has certainly left a lot with people to think about; to analyse and try to find whether there is any truth in all that is being spoken against him and BJP.